Previous versions of Android allowed you to access the dialer from the lock screen by swiping up from the bottom left corner. Android Marshmallow changed that to Google Now, allowing users to quickly access voice commands without having to unlock the phone first. If you want to use voice command on your locked screen on an Android Marshmallow phone, here’s how. Some phones may have Google Now enabled by default and others won’t. So let’s check to see if it is enabled first. 1. 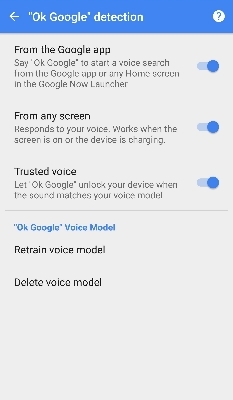 Navigate to Settings, Google, Search & Now, Voice and Ok Google detection. 2. Select From any screen and enable. 3. Select ‘From any screen’ and/or ‘From lock screen’. 4. If you receive a warning about the phone not being able to enable Google Now, ensure you have the latest updates. You will likely be asked to say ‘Ok Google’ three times out loud to train the voice model to respond to your voice. Once complete, saying that phrase will unlock the phone and allow you to access voice commands from the lock screen. Once enabled, you can now access voice commands from the lock screen. 1. Swipe from the bottom left corner of your screen in any direction. 2. The screen should wake up and you should see ‘Listening….’. 3. Google Now is ready to respond to commands. Voice command is a cool way to control your phone and is well worth exploring. It’s certainly better than hands-free when driving anyway! What to do when incoming voice we can't hear in phone call? how can I turn off voice text entry? How do i retrieve voice recording from my stolen sansung galaxy s8?